Okay, if the Beckett Mansion is #1 on my list of the most tragic Los Angeles landmarks I’ve visited so far, what there is to see of Monument No. 137, Finney’s Cafeteria, is a close #2. I don’t what was originally located on the ground floor of this four-story building built in 1898, but around 1914 architects Plummer & Feil converted the space into a soda parlor called The Chocolate Shoppe. (While 1914 is the date usually given for the establishment, I should point out Allan L. Leonard, attorney for future owner Sam Finney, later wrote that he had wooed his future wife in the space as early as 1908 when, according to him, it had been known as Petitfils Chocolate Shoppe. 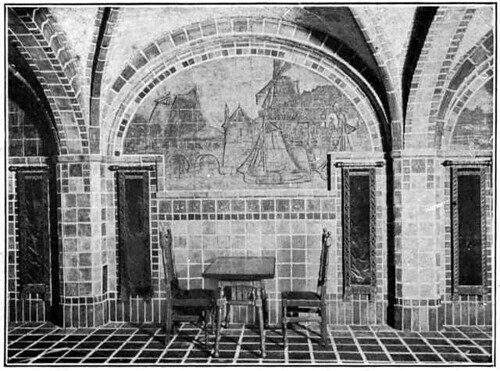 In any event, the owners hired tile-designer Ernest Batchelder to deck out the parlor in a Dutch motif, and deck it out he did. Ernest Allan Batchelder was born in Nashua, New Hampshire, in 1875. From 1902 to 1909, Batchelder was Director of Art at Throop Polytechnic Institute (i.e. CalTech), after which he set up The Batchelder Tile Company in Pasadena. He relocated the company twice, expanding it each time. 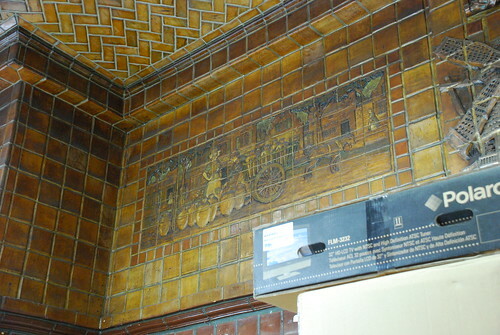 In 1926, he tackled the interior of the Fine Arts Building, landmark No. 125. At its peak, Batchelder’s company employed 150 men. Shortly after he finished one of his biggest projects, the Hershey Hotel (a parenthetical recommendation: you owe it to yourself to drive through Hershey, Pennsylvania, at least once in your life; the town literally smells like chocolate, and the street lamps are shaped like Hershey kisses), Batchelder shut down his business in 1932, irreparably damaged by the Depression. 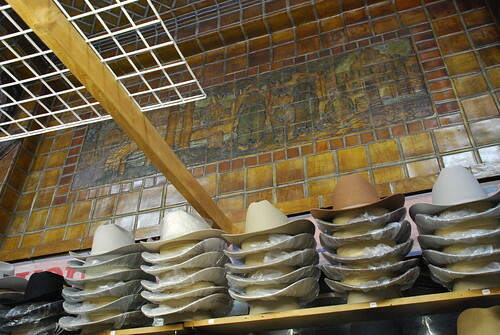 The Arts and Crafts leader continued to make pottery in his small shop on Kinneloa Street in Pasadena until the early 1950s. He died in 1957. 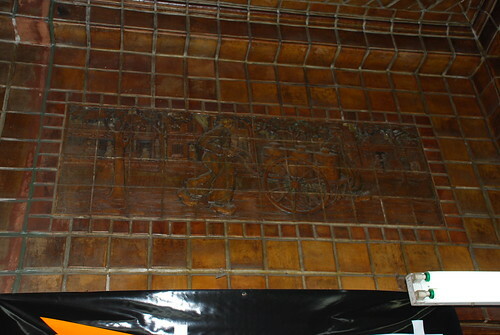 The Chocolate Shoppe, which was Batchelder’s biggest commission up until that time, was/is completely covered in his chocolatey brown work. 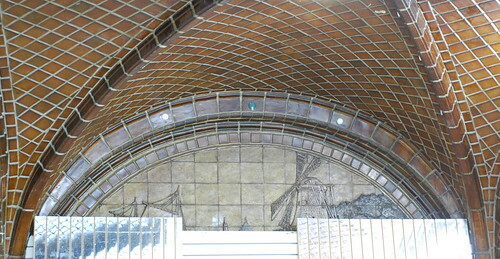 I’m talking floor, walls, and ceiling, with larger tiles – around 4” x 4” – laid into the walls while bigger murals beneath the groined arches (really, that’s what they’re called) are more mosaic. 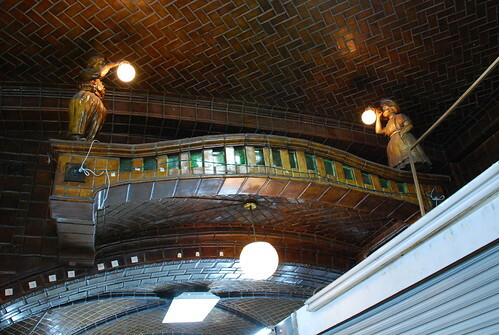 The Shoppe was to serve as a prototype for a whole chain of soda parlors, each with a different European country as its theme. 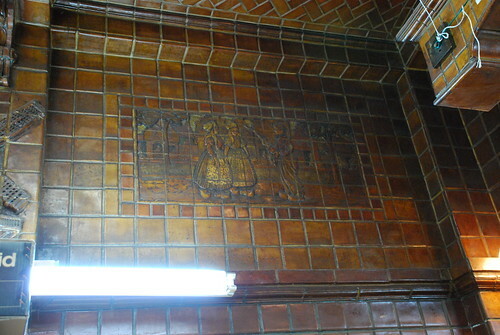 For whatever reason – some say it was the high cost of Batchelder’s work – this never came to pass, and the 6th Street location was the first and last Chocolate Shoppe. Samuel Finney later converted The Chocolate Shop into his eponymous cafeteria. When? I don’t know. A 1956 city directory lists Finney’s Cafeteria at 631 South Hill, but it had to have been long before that. In fact, I can’t even explain the South Hill address. A little help, anyone? Flash forward to 1997, when the former Finney’s/Chocolate Shoppe was defiled into the arcade of today (no offense to the employees there, one of whom gladly lent me a ladder to get some of these blurry shots). While this site hasn’t been updated in a long time, you should still visit it to get a few shots of the interior right before it was obliterated (it's also from where I pilfered the black and white shot below). Take look at what's visible today, and then, below that, see what it was like back in the teens. You know, I think this might be the clearest case, yet, of how a Historic-Cultural Monument status from the city doesn’t guarantee its preservation. Maybe because the changes don’t seem to be necessarily permanent that the city allowed such a thing to happen. I don’t know. Believe me, though, standing in the old Chocolate Shoppe, it takes just a sliver of imagination to see the space’s potential. 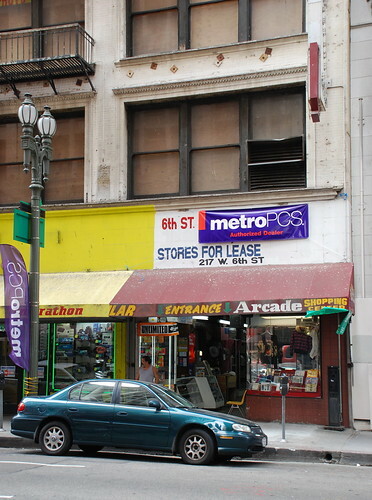 Hopefully, with plans afoot to revitalize the Broadway corridor, a small incentive will be offered to the person with funds, motivation, and good taste to rehabilitate this L.A. landmark just a couple of dozen yards away. 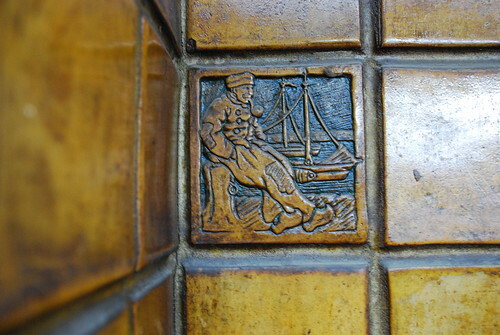 Me being a nosy person I walked into this building awile back and was in awe of the tile work and esp. the two sconces/lamps of the two figures blowing bubbles. I had no idea that this place was actually a monument. I could see alot done with this space as its beautiful and its another world just inside this small spot. Also atleast the murals are being protected in the mean time behind the shop walls. I've read bits and pieces about Finney's Cafateria but feel more informed after reading your latest post. I'd love to see the "kisses" shaped street lights in Hershey. I'm curious to know if Ernest Batchelder lived in a craftsman house above the Arroyo Seco? The $750,000 that was paid for building (at the height of the post Olympics Downtown boom) later turned out to be too much. Far larger buildings sold in the next downtown for less than that. WOW In the 80's in lived in a loft downtown. Wish I had know about this place! 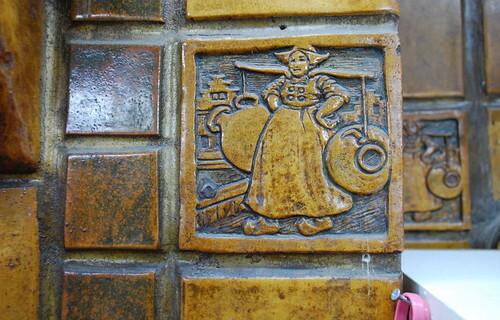 I love Batcheldor tiles. Does the Los Angeles Conservancy know about this ? Maybe you could get help there. 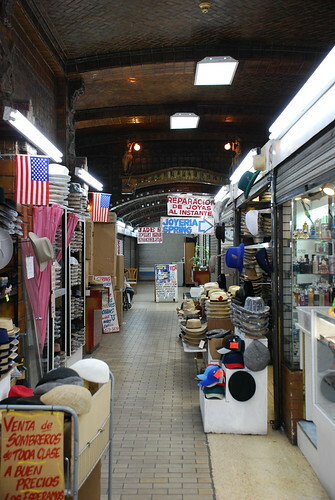 I just saw this place today (3/28/2010) and never knew it existed. Your photos show what an unknown gem it is. Maybe in the near future the place could be returned to its former glory. I just walked in there today. They are now officially renovating this place!! Really, anonymous? That's got to be seen. Thanks. renovating or restoring? sometimes renovating is not a good thing. 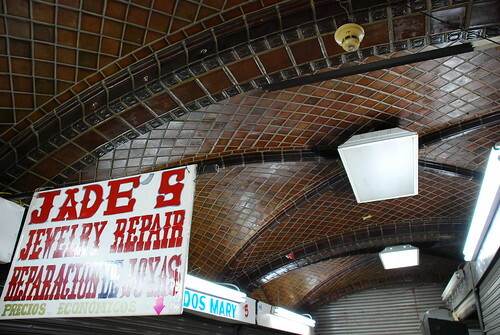 They are restoring it, and it's opening tonight for the May 2012 Art Walk!!! Check it out! I was told it would be a chocolate shoppe again. Did anyone go in May? I can't explain Finneys at 631 S Hill Street, but accourding to the 1915 Los Angeles City Directory - "Chocolate Shop (Inc), W M Petitfils sec and mgr" had three locations: "217 W 6th, 209 W 5th, and 731 S Bway"
Thanks for the sleuthing, Red Cars. 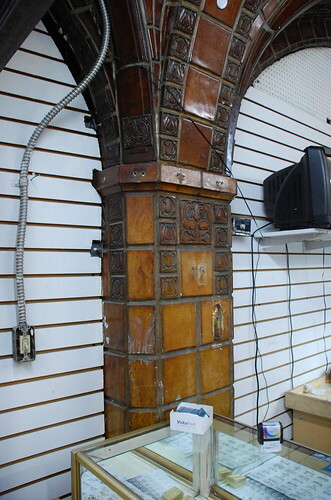 Maybe more folks will take an interest in the Shoppe's history as it becomes restored. I, too, remember going to Finney's Cafeteria with my mom on a Saturday afternoon after shopping at Broadway, Orbachs and Bullocks. It was our favorite place because they served a wonderful Orange Roll. 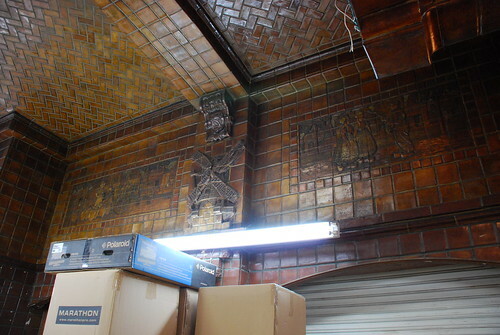 I was excited to read in the LA Times that Charles Asian will restore the beautiful shop. When I was a little girl in the 1950's and 60's my grandma and I would take the bus from our home on 120th St. to downtown LA every Saturday. Our day started with breakfast at Finney's. I especially remember their cheese Danish. 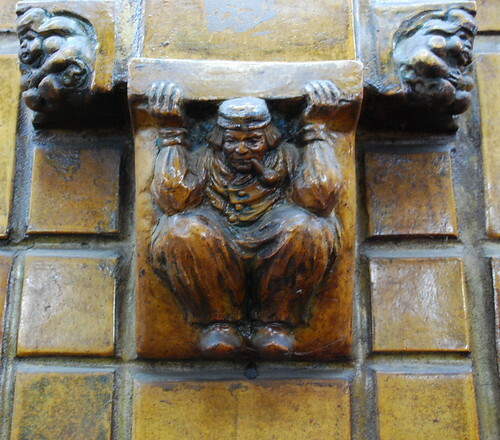 I went to Chouinard Art School( and am an artist and potter ) which became Cal Arts in the 60's and lived on Leeward near 7th.i studied architecturak tilemaking with Peter King of Florida. My husband is distantly related to Earnest Allan Batchelder and has the Batchelder name as his middle. I am related to the Chandlers, way back ,of the LA newspaper fame.Allan is a family name on my Scottish grNdmother's mom' s side. 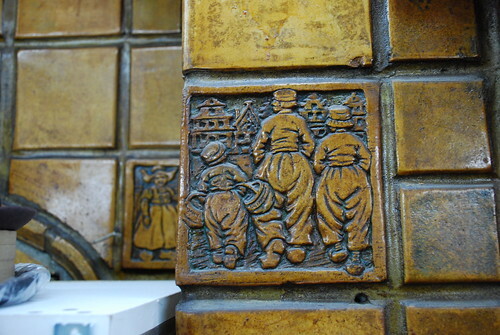 It is wonderful to hear Mr Charles Asian plans to honor Mr.Batchelder' s works.I miss living in Los Angeles.We would love to come out when this becomes a reality.I have belonged to Tile Heritage Foundation and have always admired Batchelder Tile. I hope the city historic foundation realuzed the enormity of this " find".I wish I had known of it as a college student at Chouinard taking clay classes with Ralph Bacerra and John Karrach. Thank you so much for such diligent work. I went to Finney's as a child with my grandmother. It was a place for breakfast and lunch and was always busy. They had a lady cashier in a cabinet who totaled your bill...no cash register for Finney's! 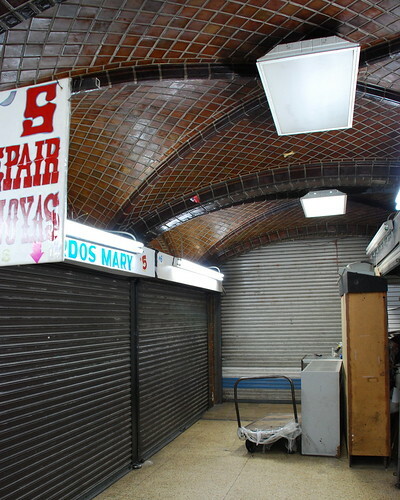 The good news is that investor Charles Asian plans to return this space into a chocolate shop(pe).